One day I read the wonderful poem “The Night Before Christmas” by Clement C. Moore and decided it would be fun to write a poem with the same rhythm and rhyme scheme for kids who celebrate Chanukah. So I did! On Chanukah we light the menorah, spin the dreidel and eat chocolate gelt. Everyone has heard the poem that begins “‘Twas the night before Christmas.” Since my family doesn’t celebrate Christmas, I wanted to write a poem based on that familiar verse for those of us who celebrate Chanukah. Mama was wrapping a gift for Aunt Dora. Grandpa was grating potatoes for latkes. And I at her feet spun my shiny new dreidel. It was making me dizzy to see them all spin. But that silly old dreidel, it just wouldn’t stop! 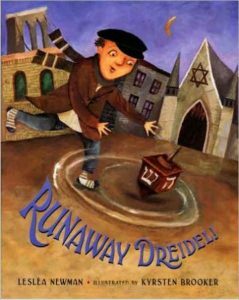 You are here: LesleaKids.com > Books for Kids & Teens > Picture Books > Runaway Dreidel!